Before prohibition it wouldn’t be uncommon to find a still inside most farm houses. Farmers used to preserve the value of their grain by distilling what they didn’t sell at market into whiskey and then selling it outside of the harvest season. Local, small batch whiskey used to be extremely common in America, but the practice was almost completely eradicated by the temperance movement in the 1920s and the ban on the production and sale of alcohol in America. We are now in a spirits renaissance with a significant number of small, artisan micro-distilleries re-emerging across the country. This explosion has created a frenzy around unique, local artisan spirits. In Portland, Oregon, one restaurant has built a bridge between the old farmhouse still and the micro-distillery boom, taking the plunge to create one of the first custom restaurant whiskeys. 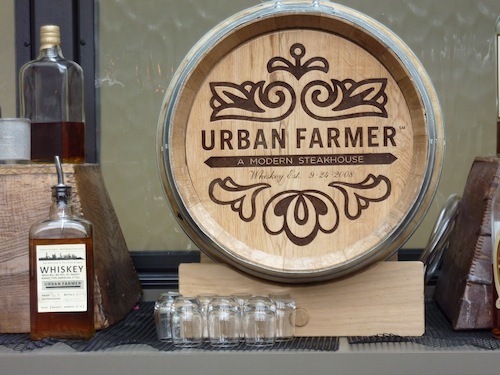 Created in partnership with House Spirits Distillery custom barrel program, Urban Farmer Restaurant has produced a unique, local and innovative spirit and blazed a trail that others will surely follow. 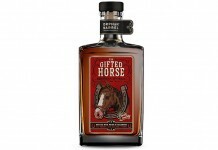 Having their own whiskey fits well with the “farm to table” philosophy of Urban Farmer, which worked with House Spirits Distillery to source locally farmed rye and barley for their custom whiskey (80% rye 20% barley). Aged in 15 gallon barrels sitting on the back bar, Urban Farmer inexorably ties the experience of their whiskey with the physical restaurant and presents a product so local that part of its crafting occurs in the location that it’s served in. Due to federal liquor laws, Urban Farmer cannot sell or ship bottles of its whiskey, so the only place to consume it is in the restaurant itself. David Marsh, Director of Operations of Food and Beverage for Sage Restaurant Group (owners of Urban Farmer), dipped a syphon into the barrel and poured me a barrelproof sample of the latest batch of Urban Farmer’s whiskey. The excitement over the spirit is contagious and I enjoyed the ‘straight from the barrel’ experience usually limited to distillery visits. The latest batch, “Batch 2”, has been aged in French Oak (right on the back bar). It’s only been in barrel for 15 months but tastes like a whiskey aged for three or more years. This is the advantage of aging in a 15 gallon barrel versus a standard 55 gallon one; with more contact between the spirit and the barrel, the whiskey is ready for prime time much sooner. This taste of “Batch 2” is firey but goes down very smooth with wonderful sweet and spice notes and a nice long finish. The batch isn’t 100% finished aging yet, and it’s set to be proofed down and put into bottles in mid June. This latest batch is one of a few variations of the Urban Farmer whiskey. 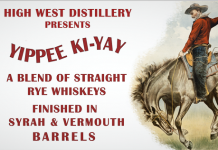 The first batch was aged both in second use American Oak and New American Oak to produce two distinct offerings, and a portion of the run was set aside to be served as white dog, or unaged whiskey. Urban Farmer’s custom whiskey is an extremely exciting step. It’s both a return to pre-prohibition American whiskey and an important extension of the modern ‘farm to table’ culinary movement which has become such an important part of modern culinary philosophies. 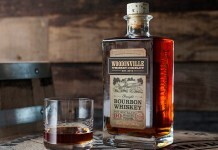 Should other restaurants or bars follow suit, it could be a major return for local whiskey in America. A glass of Urban Farmer whiskey runs $12. You can’t buy it in bottle, and the only place to experience it is at Urban Farmer Restaurant in Portland at 525 SW Morrison Street.